Expeditionary Advising the 215th ANA Corps - Not so Much! A couple of years ago the United States rapidly drew down the force levels in Afghanistan. Keeping below a troop level of 9,800 required the closure of a large number of bases and a restructuring of the mission. It was decided to keep a small counterterrorism force, some enablers & support units (drones, intelligence, logistics, air support, etc. ), and to maintain an advisory capacity at the ministry, institutional, and corps levels. However, not all the Afghan National Army corps were covered by full-time, permanent advisors co-located at or near the corps headquarters. The 203rd and 215th Corps were advised by an expeditionary package - called "Advise and Assist Cells" that operated out of Kabul. While this may have been effective for the 203rd Corps responsible for seven provinces east and south of Kabul it was probably less effective for the 215th Corps in southwest Afghanistan (Helmand and Nimroz provinces). History will probably judge that this attempt at "Level 2" or expeditionary advising was not as effective as hoped; at least not for the ANA and ANP in Helmand province. 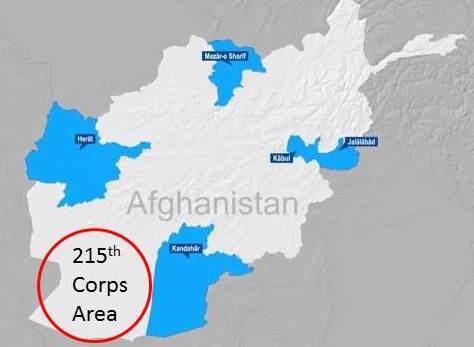 Recent news reports now indicate that a large contingent of advisors are to be deployed in Helmand province to assist the 215th Corps. Read more in "U.S. troop reinforcements head for embattled southern Afghan province", Reuters, February 9, 2016. SFA Planners Guide. For those heading out on an advisory mission there are a wealth of documents to read. One of the better ones for learning Security Force Assistance (SFA) is the Security Force Assistance Planners Guide by the Joint Center for International Security Assistance (JCISFA) at Fort Leavenworth which was just updated in January 2016.